Despite the progress achieved in breast cancer screening and therapeutic innovations, the basal-like subtype of breast cancer (BLBC) still represents a particular clinical challenge. In order to make an impact on survival in this type of aggressive breast cancer, new targeted therapeutic agents are urgently needed. Aberrant activation of the Hedgehog (Hh) signalling pathway has been unambiguously tied to cancer development and progression in a variety of solid malignancies, and the recent approval of vismodegib, an orally bioavailable small-molecule inhibitor of Smoothened, validates Hh signalling as a valuable therapeutic target. A number of recent publications have highlighted a role for Hh signalling in breast cancer models and clinical specimens. Interestingly, Hh ligand overexpression is associated with the BLBC phenotype and a poor outcome in terms of metastasis and breast cancer-related death. In this review, we provide a comprehensive overview of the canonical Hh signalling pathway in mammals, highlight its roles in mammary gland development and breast carcinogenesis and discuss its potential therapeutic value in BLBC. Breast cancer remains the leading cause of cancer-related death among women worldwide and accounts for 23% of all cancers diagnosed in 2008 , totalling approximately 1.4 million cases globally. With a lifetime risk of developing invasive breast cancer of 1 in 8, breast cancer is one of the top three cancers that caused the greatest economic impact worldwide in 2008 . Due to its frequency and cost, breast cancer represents a major public health concern. Despite progress in early detection and adjuvant therapy, the outlook for women with locally advanced or metastatic disease remains bleak . This may be due to a number of factors, including the molecular heterogeneity of breast tumours, intrinsic tumour resistance to conventional therapy, or inadequate therapy due to borderline pathological features. Extensive research has been carried out to understand breast carcinogenesis, and to develop new-targeted therapeutic agents and biomarkers to improve patient outcomes. In recent years, the Hedgehog (Hh) signalling pathway has emerged as a critical determinant of cancer initiation, progression and metastasis of an important subset of human cancers [3–5]. Recent studies have underlined an important though less understood function of the Hh pathway in breast cancer malignancy. This review will provide an update on the Hh signalling pathway and its role in the regulation of normal mammary development and the aetiology of breast cancer. The Hh pathway is an evolutionarily conserved system for regulating patterning and cell fate from Drosophila to humans. Hh proteins are secreted morphogens that play essential roles in regulation of embryogenesis, development, tissue homeostasis, regeneration and stem cell maintenance in a concentration-dependent manner . Genetic or teratogenic disruption of Hh signalling during development in vertebrates results in a characteristic series of anomalies . Perhaps most dramatic of these is holoprosencephaly, a congenital anomaly characterised by a failure of the embryonic forebrain to separate into two chambers. Normally, Hh ligand secreted by the notochord induces the ventral cell fate specification in the entire neural tube. Absence of this signal results in midline fusion of forebrain structures, including the optic vesicles, leading to cyclopia, a signature defect commonly associated with loss of function mutations in the Hh pathway [3, 4]. In addition, aberrant Hh signalling in adults results in carcinogenesis, metastasis and chemoresistance . Three mammalian Hh ligands have been identified, namely Sonic Hedgehog (SHH), Indian Hedgehog (IHH) and Desert Hedgehog (DHH) . They are synthesised as 45 kDa precursor proteins that are auto-processed into two fragments, an amino-terminal (HhN) and a carboxyterminal (HhC) polypeptide. HhN mediates Hh signalling whereas the function of HhC is still not firmly established . HhN is coupled to a cholesterol moiety at its carboxyl terminus as part of this processing reaction, and then undergoes palmitoylation at its amino terminus, mediated by the Hedgehog acyltransferase (HHAT) . This process of dual lipid modification has important implications in intracellular trafficking, secretion and range of action of the Hh ligand. Subsequent release of Hh requires Dispatched (DISP), a large multipass transmembrane protein that transports the ligand across the plasma membrane . In vertebrate species, Hh signalling requires an intact microtubule-based organelle named primary cilium. In the absence of ligand binding, the Hh receptor Patched (PTCH) localises at the base of the primary cilium and constitutively inhibits pathway activity (Figure 1A). Binding of the processed and dual lipid-modified Hh ligand to PTCH abolishes the inhibitory effect of PTCH on Smoothened (SMO), the essential positive mediator of the entire pathway (Figure 1B). PTCH is a large 12-pass transmembrane protein of 1,500 amino acids . There are two structurally related PTCH homologs in mammals, named PTCH1 and PTCH2. The amount of SHH available to bind PTCH is tightly regulated by Hh-binding proteins such as Hh-interacting protein (HHIP) and Growth arrest-specific gene (GAS1), which act as negative and positive regulators, respectively (Figure 1A) . In parallel, CDO (Commodo) and BOC (Brother of Commodo) facilitate Hh-binding to PTCH1 in a calciumdependant manner . Glypican-3, a member of the heparan sulfate proteoglycan family, interacts with high affinity to the Hh ligand and has also been implicated in inhibiting the Hh pathway by competing with PTCH for Hh binding . Other proteins such as Megalin, Vitronectin, Perlecan, Scube2 and Shifted have been reported to bind Hh ligand in vertebrates but the nature and consequences of their interaction are not well understood . Model of the canonical Hedgehog signalling pathway in mammals. (A) In the absence of Hedgehog (Hh) ligand, the receptor Patched (Ptch) inhibits the activation of Smoothened (Smo) by preventing its surface translocation into the cilium. The Glioma-associated (GLI) proteins are phosphorylated and processed to truncated repressor forms. This inactive GLI protein complex functions as a transcriptional repressor of Hh target gene expression. Suppressor of fused (SUFU) inhibits GLI1 and GLI2 from entering the nucleus by sequestering the complex to the microtubules and represses transcription. (B) The binding of Hh ligands to Ptch releases the repression on Smo, leading to the movement of Smo from an intracellular vesicle to the tip of the primary cilium. Activated GLI proteins then translocate to the nucleus and promote the transcription of target genes. To note, Hh ligand binding is regulated by cell surface proteins: Hh-interacting protein (HHIP) and heparan sulfate proteoglycans (HSPGs) compete with the Hh-binding while GAS1 (Growth arrest-specific gene), Cdo (Commodo) and Boc (Brother of Commodo) proteins facilitate Hh-binding to Ptch. Following binding of Hh ligand, the Hh-PTCH complex is internalised and SMO then moves from intracellular vesicles to the primary cilia, promoting Hh downstream signalling (Figure 1B). SMO is a 7-pass transmembrane-spanning protein with homology to G-protein-coupled receptors . Activated SMO translocates to primary cilia at the cell membrane and in turn decouples Glioma-associated oncoproteins (GLIs) from an inhibitory multi-protein proteolytic complex, leading to stabilisation of full length, transactivating GLI proteins (Figure 1B). The GLI proteins, composed of three family members, GLI1 to GLI3, belong to the Kruppel family of zinc finger transcription factors. GLI1 acts exclusively as a trans criptional activator whereas GLI3 is mainly repressive . GLI2 displays both activating and repressive functions, depending on the cellular context and the level of SMO-regulated proteins . 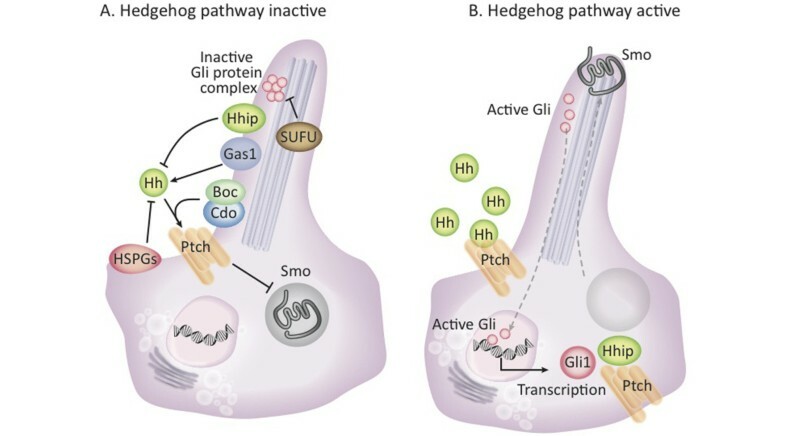 The balance of the activator and repressor functions of these three GLI factors, the so-called 'GLI code', determines the status of the Hh transcriptional program and ultimately the behaviour of the responding cells . Genomic analysis has identified several hundred GLI target genes, many of which can exhibit either a global (multiple Hh-responsive tissues) or a tissue/cell-specific pattern of expression . However, a number of commonly identified targets have been characterised in detail. Apart from GLI, PTCH, and HHIP, the GLI1 and GLI2 proteins activate genes involved in cellular proliferation (CCND1/2, MYCN, SPP1, BMI-1, IGFBP6, FOXM1), survival (BCL2, MDM2), angiogenesis (VEGF, ANGPTL1/2, CYR61) and epithelialmesenchymal transition (BMP1, MUC5AC, SNAI1, JAG2) . Although Hh signal transduction is dependent on the presence of an intact primary cilium in normal developing cells, the role of cilia in human tumour development and aggressiveness is more complex . By using a transgenic model of ligand-driven Hh pathway activation, García-Zaragoza and collaborators  showed that the Hh-responding cells within the epithelial compartment of the mouse mammary gland are ciliated basal cells, which expand in response to the secretion of SHH ligand. In contrast, SHH-expressing luminal cells rarely exhibit an intact primary cilium and therefore do not respond to Hh activation . Other studies in mouse models demonstrated that primary cilia are either required for or inhibit tumour formation, depending on the nature of the oncogenic initiating event [18, 19]. Ciliary ablation strongly inhibited the development of basal cell carcinoma (BCC) and medulloblastoma when these tumours were driven by an activated form of the transmembrane protein SMO. Conversely, removal of cilia accelerated tumourigenesis induced by constitutively active GLI2 [18, 19]. It is important to consider that 'non-canonical' Hh signalling, in which Hh pathway components signal outside of the HH-PTCH1-SMO-GLI paradigm, also occurs and can play important physiological roles, as reviewed by Jenkins . At least three scenarios of noncanonical Hh signalling activation have been observed: 1) Hh signalling through Hh pathway members but independently to GLI-mediated transcription (for example, PTCH1 can act as a dependence-receptor, recruiting a protein complex in the absence of HH that ultimately enhances cell death through a caspase-9-dependent mechanism ); 2) atypical interaction between Hh pathway components; 3) crosstalk between Hh signalling and components of other molecular pathways . Non-canonical signalling has functions in regulating cell motility, cell proliferation via activation of the cell cycle and in activating the programmed cell death . Recent evidence has also defined a contribution of non-canonical Hh signalling in malignancy, and especially in breast cancer metastasis to bone . Mammary gland development is unique in that it occurs predominantly in the postnatal period. While there are certain differences, mammary development in mice and humans is relatively similar, and the mouse has been extensively used as a model to define the role of Hh signalling in mammary development . Mammary gland development can be divided into three phases-embryonic, non-parous and pregnant/lactating . Mammary gland development begins with the formation of rudimentary ductal trees that remain quiescent until the onset of puberty. During puberty in the mouse, terminal end buds (TEBs), bulb-shaped structures made up of multiple layers of immature, rapidly dividing epithelial cells, appear at the end of the ductal tree and generate secondary and tertiary branches. Once the ducts invade the mammary fat pads, the TEBs regress and proliferation ceases. Extensive lobuloalveolar development and differentiation occur during pregnancy, followed by milk production and secretion at parturition. Upon weaning, the alveolar epithelium undergoes apoptosis and the mammary gland is remodelled, returning to its mature virgin state . Components of the Hh pathway have been identified in the mouse mammary gland during the embryonic, nonparous and pregnant phases. Although Shh and Ihh mRNA are detected within the mammary epithelium of mouse embryo, neither is required for bud development . Microarray profiling of the mouse postnatal mammary gland reveals that Dhh is upregulated in TEBs compared to the stroma and ducts whereas Shh and Ihh are not , although the requirement for DHH in this process has not be examined. GLI1 expression is absent from mammary epithelium and mesenchyme. The repressor GLI3 is present in the epithelium and stroma whilst GLI2 is detected only in the stromal component during embryonic and non-parous phases of development [26, 27]. During the pregnancy and lactation state, GLI2 is expressed within both the epithelial and the stromal compartment . Despite the presence of these components, it appears that active Hh signalling is dispensable for mouse mammary gland morphogenesis both before and after birth. In fact, normal mammary gland development seems to be dependent on Hh pathway repression. Embryos that are null for either Gli1 or Gli2 have no obvious defects in mammary bud formation . In contrast, constitutive activation of GLI1 or lack of functional GLI3 have individually resulted in failure of mammary bud formation in mouse models . Additionally, overexpression of SHH in transgenic mouse embryos results in mammary bud anomalies, including the absence of mammary buds . In pubertal mice, constitutive activation of SMO or heterozygous loss of PTCH1 results in morphologic TEB abnormalities, which are reminiscent of human ductal hyperplasia [29, 30]. Further studies using phenotypic and transplantation analyses of mice carrying the mesenchymal dysplasia allele of patched 1 (Ptch1(mes)) revealed a failure of gland development, post-pubertal ductal elongation and delayed growth with ductal hyperplasia in these mice [30, 31]. It has been also shown that the transcriptional repressor GLI2 cooperates wiThGLI3 in normal postnatal mouse mammary gland development. This theory is supported by the development of abnormal and distended branching in mice transplanted with Gli2-null glands . GLI1 overexpression in mouse mammary epithelial cells leads to a defect in the complexity of the alveolar network, an inability to lactate and, importantly, the appearance of hyperplastic lesions and tumour development . Finally, ciliary dysfunction in the mammary gland results in abnormal branching morphogenesis along with reduced lobular-alveolar development during pregnancy and lactation . Altogether, these data demonstrate that de-regulation of Hh signalling can perturb mammary development and promote mammary carcinogenesis. Delineation of the mammary stem cell hierarchy is still a work in progress. Visvader and colleagues  and Eaves and colleagues  provided the first evidence for a rare multipotent mammary stem cell identified by a combination of cell surface markers (CD24, CD29, CD44, CD49f and EpCAM). Recent genetic lineage-tracing experiments in mice enlighten our understanding of the cellular hierarchy of the mammary gland during development and in adult [36, 37]. By using specific lineage-tracing of the mammary gland in luminal or in myoepithelial cells, Van Keymeulen and collaborators  demonstrated the existence of long-lived unipotent basal and luminal stem cells that display extensive renewing capacities during puberty and the cycles of pregnancy and lactation. Interestingly, these studies have also shed light on the cellular origin of breast cancer, with recent works demonstrating that luminal progenitors, rather than basal cells, can give rise to the basal-like subtype of breast cancer (BLBC) [37–39]. PTCH1, GLI1 and GLI2 genes are expressed in normal human mammary stem/progenitor cells cultured as mammospheres and are down-regulated during differentiation . Activation of Hh signalling using Hh ligand or GLI1/GLI2 overexpression increases mammosphere formation, mammosphere size and multi-lineage progenitors, whereas inhibition of the pathway via cyclopamine results in a reduction of tumourigenic potential . GLI1-induced tumours are histologically heterogeneous and involve the expansion of a population of epithelial cells expressing the putative progenitor cell marker cytokeratin 6 . Hh effects on mammary stem cell self-renewal are associated with activation of the polycomb gene BMI-1 . In parallel, activated human SMO under the mouse mammary tumour virus (MMTV) promoter in transgenic mice also increased the mammosphere-forming efficiency of primary mammary epithelial cells but decreased the frequency of regenerative stem cells in vivo, suggesting that enhanced mammosphere-forming efficiency is attributable to increased survival or activity of division-competent cell types under anchorage-independent growth conditions . Interestingly, intra-epithelial paracrine Hh signalling has been proposed to regulate the elaboration of the mammary progenitor compartment . Hh ligand exerts a mitogenic effect on mammary stem cells, thereby activating the differentiation of mammary epithelial progenitor cells via differential TP63 promoter selection. Differential TP63 promoter usage underlies the specific expression of IHH ligand, which promotes further a positive feedback elaboration of mammary progenitors . Enhanced Hh activity then plays a role during pregnancy-associated mammary gland expansion. Interestingly, emerging data have suggested that Hh signalling regulates cancer stem cells and could play a crucial role in carcinogenesis [43–46]. Two main mechanisms have been demonstrated for Hh-mediated malignancy. Constitutive Hh signalling activation is due either to mutation of the Hh pathway components (ligand-independent) or through Hh overexpression (ligand-dependent) (Figure 2). GLI gene amplification was first reported in malignant glioma . Subsequently, inactivating mutations in the PTCH1 gene and activating SMO mutations were identified in BCC, medulloblastoma and rhabdomyosarcoma (Figure 2.1) . Other Hh pathway components may also be genetically altered in human cancers, including SUFU, GLI1 and GLI3 . In parallel, an expanding range of ligand-dependent cancers involving Hh overexpression has been identified in the past few years. Different models of Hh ligand-dependent activation have been demonstrated. Tumour cells can produce the Hh ligand and stimulate themselves in an autocrine/juxtacrine manner (Figure 2.2) or induce pathway activity within the neighbouring stromal cells in a paracrine manner (Figure 2.3B). Paracrine Hh signalling is then amplified by the fact that stromal cells secrete additional factors that promote tumourigenesis and survival of the tumour. Hh protein can also be produced by the stroma and stimulate the tumour cells, as demonstrated in multiple myeloma (Figure 2.3A) . Three basic mechanisms of Hedgehog constitutive activation in cancer. 1. Hedgehog (Hh) ligand-independent signalling observed in basal cell carcinoma, medulloblastoma and rhabdomyosarcoma is caused by inactivating mutations in the Ptch1 gene (red asterisk) or activating Smo mutations (yellow star). It leads to the constitutive activation and transcription of the Hh target genes even in the absence of Hh ligand. 2. 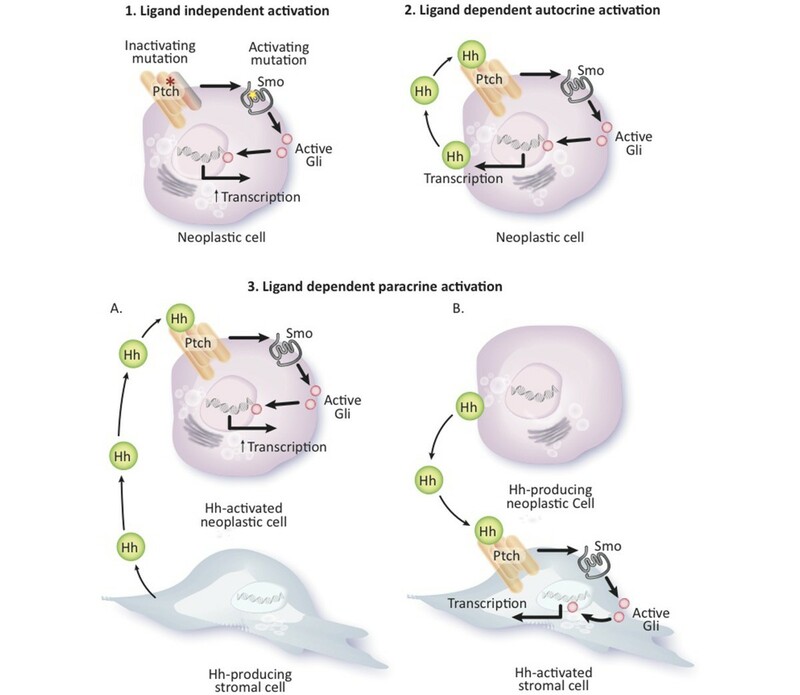 Hh ligand-dependent autocrine/juxtacrine activation observed in melanoma and lung cancers is associated with an over-expression of Hh ligand by the neoplastic cells, leading to a cell-autonomous stimulation. 3. Hh ligand-dependent paracrine activation is due to the over-secretion of Hh ligand by the non-malignant stromal (A) or the neoplastic cells (B). In the basal-like subtype of breast cancer, a crucial paracrine mode of canonical Hh signalling has been described by our group: the epithelial tumour cells secrete Hh ligand, leading to Hh pathway activation by the stroma. Stromal cells produce unknown additional growth or survival signals within the microenvironment that promote tumourigenesis (B). GLI, Glioma-associated oncoprotein. The potential role of Hh signalling in breast cancer is not well defined; however, recent studies have begun to shed light on its potential importance, particularly in aggressive subgroups such as triple-negative disease . Early studies on small numbers of breast cancer samples showed rare mutation events in SHH and PTCH genes [50, 51]. However, subsequent studies evaluating larger cohorts did not reveal any mutations in SHH, PTCH or SMO . More recently, comparative genomic hybridisation analysis identified a frequent loss of PTCH1 locus and amplification of GLI1, independently of the breast tumour subtype [53, 54]. Furthermore, a nonsynonymous mutation in PTCH2 has been described in the primary tumour and brain metastasis of a patient with BLBC . However, a functional importance for any of these identified genetic anomalies requires further investigation in breast cancer. Evidence for ligand-dependent breast carcinogenesis has been demonstrated by several groups. It was first reported when Kubo and colleagues  identified the expression of SHH, PTCH1 and GLI1 in invasive carcinomas but not in normal breast epithelium by immunohistochemistry. These data correlate with findings that our group recently published regarding a cohort of 292 human infiltrating ductal carcinomas . We showed that different subsets of cancers express Hh ligand in the epithelium and/or stroma. Interestingly, we reported that epithelial Hh ligand expression is an early event in mammary carcinogenesis, strongly associated with a basal-like phenotype and poor outcome in terms of metastasis and breast cancer-related death . We further demonstrated that ectopic expression of Hh ligand in a mouse model of BLBC led to the development of rapidly growing, high grade invasive tumours compared to controls . Little is known about the mechanism underlying the up-regulation of the Hh ligand in solid malignancies, including breast cancer. SHH promoter region hypomethylation is frequently observed in breast carcinomas and is significantly associated with SHH up-regulation [58, 59]. SHH gene transcription may not be solely dependent on promoter demethylation but could also be regulated by transcription factors . A positive correlation between the expression of the transcription factor NF-κB and SHH up-regulation was observed in breast clinical samples . The transcription factors p63 (a homologue of the tumour suppressor protein p53) and Runx2 (a key factor for osteolytic metastasis induced by breast cancer cells) have also been found to regulate the expression of Hh ligands [61, 62]. Several groups have evaluated the clinicopathological significance of Hh signalling in human breast neoplasms. A progressive increase in Hh expression and Hh pathway activation has been observed in lesions with greater cytological and atypical disease: from nonneoplastic masses to ductal carcinoma in situ (DCIS), DCIS with microinvasion, to invasive ductal carcinoma (IDC) [57, 63]. Hh pathway activation also correlates with younger age of diagnosis (<50 years), high proliferating index of Ki67, larger tumour size, invasion, lymph node metastasis, progesterone receptor-negative status and poorer overall survival [57, 63, 64]. Additionally, our laboratory also identified a strong correlation between Hh overexpression and BLBC. No association was found with any other subtype . In parallel, Moraes and collaborators  observed a loss of expression of epithelial and stromal PTCH1 in approximately 50% of DCIS and IDC. Methylation of the PTCH promoter was further correlated with low PTCH1 expression in human breast neoplasms . Conversely, SMO, undetectable in the normal tissue, was ectopically expressed in approximately 70% of DCIS and approximately 30% of IDC . Recently, Ramaswamy and colleagues  demonstrated that the non-canonical Hh signalling is an alternative growth-promoting mechanism in tamoxifen-resistant breast tumours. Early studies suggested autocrine/juxtacrine Hh signalling in a variety of cancers, including small cell lung, gastric, colorectal, pancreatic, melanoma and prostate cancers. Significant evidence exists to support an important role for the Hh-GLI1 pathway within neoplastic cells in promoting growth, stem cell self-renewal and metastatic behaviour in advanced cancers [45, 46, 66–68]. For instance, tissue sections of metastatic melanoma showed expression of SHH, PTCH1, and the three transcriptional mediators GLI1-3 specifically in melanocytes . Similarly, GLI1 protein expression has been detected within the epithelial tumour mass of colon cancer both in the primary site and in liver metastases . Interestingly, RNA interference-mediated knockdown of GLI1 or GLI2 in melanoma and colon cell lines or treatment with the SMO antagonist cyclopamine in vitro or as xenografts in vivo strikingly reduced tumour growth [45, 46, 66–68]. Recently, Park and collaborators  demonstrated that the Hh signalling acts within an autocrine/juxtacrine loop in small cell lung cancer, autonomously and independently of the lung cellular microenvironment. However, given that the Hh pathway regulates embryogenesis through stromal-mesenchymal interaction, several recent publications have provided compelling evidence that Hh signalling operates through paracrine signalling between neoplastic cells and the tumour microenvironment in many cancers [69–71]. Yauch and colleagues  highlighted the paracrine requirement for Hh signalling in pancreatic primary tumours. Using a specific small molecule SMO antagonist, a neutralising anti-Hh antibody and genetic ablation of SMO in the murine stroma, the investigators made the key observation that the secretion of Hh ligand by epithelial cells does not correlate with the expression of the Hh target genes in the tumour compartment but rather is associated with canonical activity in stromal cells. Co-culture of SHH-producing pancreatic cell lines with fibroblasts stably transfected with a GLI reporter construct results in the induction of GLI reporter activity in the fibroblasts. Surrounding stromal cells in turn may support tumour growth by secreting soluble factors, which remain to be determined. Additional evidence for a paracrine model of Hh signalling in cancer progression has been discussed comprehensively elsewhere [70, 71]. In the context of breast cancer, paracrine Hh signalling appears to be an important mechanism by which Hh supports tumour growth. The epithelial breast tumour cells secrete Hh ligand, leading to Hh pathway activation by the stroma. Among the earliest pieces of evidence was the observation that whole mammary gland transplantation from Ptch1 heterozygous mice into athymic mice with intact PTCH1 maintained their dysplastic phenotype . Conversely, transplantation of epithelium from Ptch1 heterozygous mice into wild-type cleared fat pad recipients resulted in the loss of dysplasia, suggesting a stromal requirement for PTCH1 . Interestingly, similar observations were made with a Gli2-null mouse model, reinforcing the theory of Hh paracrine signalling in breast tumours . Mammary luminal epithelial cells expressing a SMO transgene stimulate specifically the proliferation of surrounding wild-type cells in a short-range paracrine or juxtacrine manner, while the proliferation of SMO-positive cells themselves was not altered . These results correlate with the observation that SMO-positive cells are rarely proliferative in DCIS and IDC samples . Furthermore, analysis of Hh pathway localisation in primary breast cancers reveals that, in many cases, SHH and DHH ligands are expressed in the neoplastic epithelial cells rather than in stroma. In contrast, the expression of GLI1, GLI2 and SMO transcripts is considerably higher in fibroblasts than in epithelial cells . Patients with evidence of such paracrine signalling have a poor prognosis phenotype . Mouse models of BLBC also provide further evidence for paracrine signalling. The M6 cell line model of BLBC displays exclusively paracrine signalling in response to Hh overexpression in the epithelium . Furthermore, treatment of mice carrying three different primary patient-derived BLBC xenografts with the Hh-neutralising antibody 5E1 led to reductions in GLI1 and PTCH1 expression in the mouse stromal cells but not in the human neoplastic cells (unpublished data) . Other groups have also identified a potentially important role for Hh signalling in breast cancer. Harris and collaborators  validated our finding that over-expression of SHH in breast cancer cells promotes aggressive behaviour of xenografts, but in addition demonstrated that SHH through GLI1 upregulates a pro-angiogenic (VEGF-independent) secreted molecule, CYR61. Furthermore, silencing CYR61 in their triple-negative model attenuated the malignant phenotype associated with reduced tumour vasculature and less haematogenous spread . These findings suggest a crucial paracrine mode of canonical Hh signalling in the progression and invasiveness of BLBC, although we cannot exclude autocrine signalling within other subsets of patients or a subpopulation of epithelial cells within cancers such as cancer stem cells. The epithelial-to-mesenchymal transition (EMT) program is a biological process that allows polarised epithelial cells to become invasive and motile mesenchymal-like cells and has emerged as a topic of intense interest in breast cancer metastasis research . Oncogenic EMT is linked to other pro-metastatic phenotypes, including resistance to chemo-and radiation therapy, self-renewal, evasion of the immune system and anoikis resistance . Repression of E-cadherin expression by the action of several EMT-inducing transcription factors, such as Snail and Slug, is a critical step driving EMT. The expression of Snail correlates inversely with the prognosis of breast cancer patients . The function of the Hh pathway in inducing EMT and invasion of breast cancer has not been well assessed. Ectopic expression of GLI1 induces the nuclear Snail expression and concomitant loss of E-cadherin expression in mouse mammary gland tissue during pregnancy . Moreover, the transcription factor FOXC2 promotes mesenchymal differentiation during EMT via the Hh pathway and Snail up-regulation. FOXC2 is required for the ability of the BLBC subtype to metastasise specifically to the lung . The Hh signalling pathway is associated with the metastatic process in a variety of solid malignancies [19, 46, 67]. Studies specific to Hh-mediated breast cancer metastasis have focused essentially on skeletal metastases. Complex paracrine signalling mediates osteolysis in the bone matrix, releasing cytokines such as transforming growth factor-β, which acts in a non-canonical manner [22, 79]. GLI2 then induces the secretion of the parathyroid hormone-related protein (PTHrP), perpetuating a cycle of bone resorption and macrometastatic outgrowth [22, 79]. Runx2, a transcription factor highly expressed in bone metastatic breast cancer cells, also mediates PTHrP activation through IHH up-regulation . In parallel, the secretion of Hh ligand by breast tumour cells mediates a crosstalk with the bone environment in a paracrine manner, disrupting the homeostasis between the osteoclasts and osteoblasts [80, 81]. Hh ligand activates the transcription of osteopontin (OPN) by the osteoclasts, promotes osteoclast maturation and resorptive activity, and facilitates osteoblast-enhanced osteolytic metastases [80–82]. Thus, colonisation of the bone metastatic site is facilitated by the cross-activation of the Hh pathway by breast cancer cells. Despite advances in terms of radio-, chemo-and hormonal therapy, 20 to 30% of patients with early breast cancer will experience loco-regional recurrence with distant metastasis . The BLBC subtype presents a particular clinical challenge. In general, patients with BLBC tend to have a higher rate of distant relapse after diagnosis, a rapid progression from distant recurrence to death, and only an approximately 50% 10-year survival . Much of the remarkable improvement in breast cancer outcome achieved in recent years is attributed to the use of targeted therapies inhibiting the oestrogen receptor (ER; tamoxifen) or HER2 (trastuzumab) in ER+ and HER2+ enriched subtypes, respectively. However, the majority of BLBC cases are negative for ER and HER2 expression and women who present with recurrent BLBC have usually failed standard adjuvant therapy. Thus, BLBC remains a subtype with a poor prognosis for which no targeted agents are clinically approved. In order to make an impact in survival on this type of aggressive breast cancer, there is an urgent need for new targeted therapeutic agents and companion biomarkers that are predictive of response. The first naturally occurring Hh inhibitor identified was termed cyclopamine. Isolated from the wild corn lily Veratrum californicum, this steroidal alkaloid was discovered through investigations of one-eyed, or cyclopic, lambs whose mothers grazed on corn lily  (Table 1; Figure 3). Cyclopamine was the first to be shown to inhibit Hh signalling by binding SMO but did not represent a suitable therapeutic agent due to its poor bioavailability, short half-life, non-specific toxicity and chemical instability . Several Hh inhibitors have been subsequently identified via large-scale chemical library screening approaches. In general, these compounds can be classified as specific inhibitors of Hh ligand, SMO or GLI transcription factors . CNS, central nervous system; GLI, Glioma-associated oncoprotein; HH, Hedgehog; SMO, Smoothened. Small-molecule Hedgehog pathway inhibitors and effects on the Hedgehog signalling pathway. Currently, all of the small-molecule Hedgehog (Hh) pathway therapeutics in clinical trial target Smoothened (SMO). Several compounds targeting the Hh pathway either upstream or downstream of SMO are under development and could be an alternative strategy to overcome acquired resistance to Smo-targeting therapies. GLI, Glioma-associated oncoprotein;HHIP, Hh-interacting protein; PTCH, Patched. All of the small-molecule Hh pathway inhibitors that are currently investigated in phase I to III clinical trials target SMO. They include GDC-0449 (Erivedge/vismodegib), LDE225, IPI-926, BMS-833923, itraconazole, PF-0444913, LEQ506 and TAK-441 (Figure 3; Table 1). All are very well tolerated with few dose-limiting side effects in adults. These inhibitors are in clinical trials either as monotherapy or in combination with other antineoplastic agents in a wide range of malignancies such as BCC, medulloblastoma, sarcoma, small cell lung carcinoma, and ovarian, prostate, pancreas, colon and haematological cancers . Importantly, the small-molecule GDC-0449 (Curis Inc./Genentech) was approved in January 2012 by the United States Food and Drug Administration for the treatment of adults with locally advanced and metastatic BCC . A multicenter phase II study involving 96 BCC patients demonstrated overall response rates of 43% and 30% in patients with locally advanced and metastatic disease, respectively . While the GDC-0449 antagonist has positive effects in BCC, clinical results in Hh ligand-dependent solid tumours have been less encouraging . An additional challenge to the clinical use of Hh pathway antagonists is acquired resistance. For example, treatment of a PTCH1-mutant medulloblastoma patient with the small molecule GDC-0449 resulted in a rapid relapse due to an acquired tumour-specific mutation in SMO and the loss of interaction between the SMO mutant and the drug . In order to overcome acquired resistance to SMO-targeting therapies, the second-generation HhAntag, Compound 5 and itraconazole (Sporanox®, Johnson&Johnson) agents have been developed and are in ongoing clinical trials (Figure 3) [5, 92, 93]. They prevent the Hh-induced accumulation of SMO in the primary cilium (Table 1). 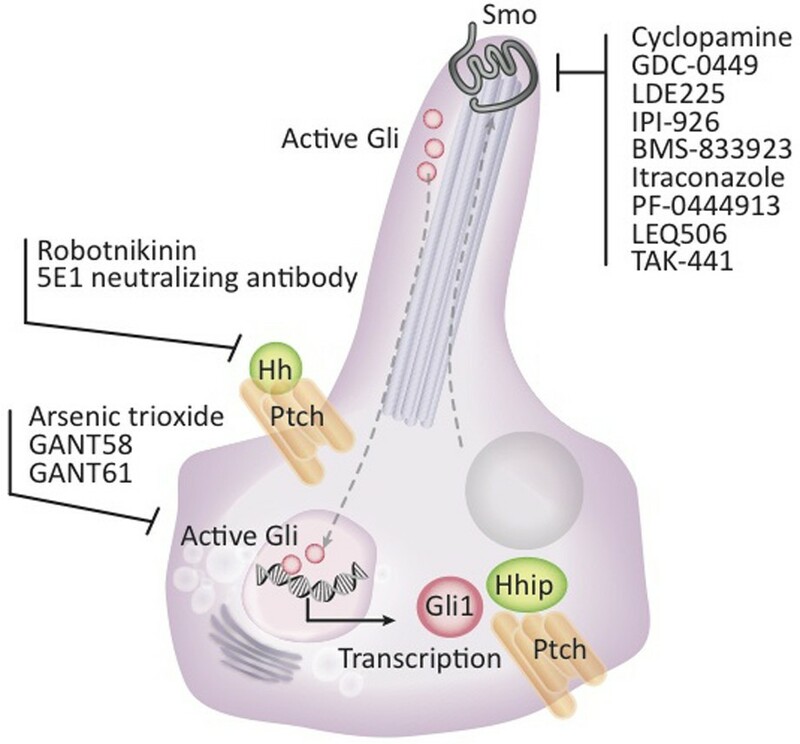 The use of antagonists that target the Hh pathway downstream of SMO, such as GANT58 and GANT61, which blocks GLI transcriptional activity, represent an attractive therapeutic strategy in the context of resistance driven by SMO mutations. In vitro and in vivo studies of a number of malignancies treated with GANT61 have produced promising results . Additionally, four new GLI antagonists have been identified in a large-scale, high-throughput screening by Hyman and collaborators . Interestingly, recent preclinical evidence shows that arsenic trioxide, a drug approved for the treatment of acute promyelocytic leukemia, inhibits the growth of Ewing sarcoma and medulloblastoma cells by targeting GLI proteins [96, 97]. The outcome of clinical trials of these agents are much awaited for the evaluation of GLI inhibitors in the prevention and/or treatment of human malignancies. Inhibitors upstream of SMO include the small molecule robotnikinin and neutralising antibodies, directed against the Hh ligand (Figure 3; Table 1) . A number of experimental studies suggest that Hh signalling represents a tractable and efficient pharmacological target in BLBC and may further improve the efficacy of chemotherapy and/or radiation treatment, as has been suggested in oesophageal and pancreatic carcinomas . There are already a number of clinical trials employing these strategies, notably in pancreatic and colorectal cancer . Currently, one clinical trial of an Hh inhibitor has been conducted specifically in breast cancer, with GDC-0449 used in combination with a gamma-secretase inhibitor to treat women with advanced breast cancer (NCT01071564), but this trial has been suspended owing to side effects associated with this particular combination therapy. A phase I dose study of oral LDE225 in combination with the phosphatidylinositol-3-kinase inhibitor BKM120 carried out by Novartis (NCT01576666) and a pilot trial of itraconazole pharmacokinetics (NCT00798135) are currently recruiting patients with metastatic breast cancer . As has been the case with the development of many molecular targeted therapeutics for breast cancer, clinical success is dependent upon careful patient selection and appropriate combination therapy. This is best exemplified by trastuzumab, where development of a companion biomarker allowed clinical trials to find efficacy within the 10 to 15% of women with HER2-overexpressing disease . When considering Hh as a therapeutic target for breast cancer, it is first important to characterise the cellular and molecular nature of the complex paracrine Hh signalling present in breast cancer, especially since the therapeutic target may be SMO expressed by the normal stromal cells rather than the neoplastic cells themselves. Equally important is the development of sensitive biomarkers of Hh pathway activation to identify the subset of cancers likely to respond to Hh-targeted therapeutics. Well-validated predictive biomarkers allow enrichment of the patient population for responders, sparing patients who are unlikely to respond to futile and potentially toxic therapy. Using GLI1 as a biomarker of Hh pathway activity, our own data suggest that approximately two-thirds of BLBC cases demonstrate evidence of paracrine Hh signalling , although such cases with evidence of paracrine signalling were seen across all subtypes of disease. However, GLI1 expression and activity are regulated by other signalling pathways, including Ras and transforming growth factor-β in a SMO-independent fashion , making it an imprecise biomarker of Hh pathway activity. In this review, we highlighted the current knowledge and recent findings regarding the involvement of the Hh developmental signalling pathway in breast development and carcinogenesis. The majority of evidence suggests that Hh signalling must be suppressed for appropriate mammary development and function. However, a number of clinical and experimental studies demonstrate that the Hh pathway is activated in a proportion of breast cancers and plays a critical role in aggressive breast cancers, including BLBC. Inhibiting this pathway in mouse models of triple-negative breast cancer dramatically decreases tumour growth and metastatic spread. The microenvironment has long been known to play a key role in breast development and disease . The Hh pathway is emerging as an important paracrine mediator by which cancer cells can remodel their stromal microenvironment. This has important implications for a novel therapeutic approach directed at the non-neoplastic stromal cells in the tumour as a complement to conventional cytotoxics and rationally designed therapies targeting the neoplastic cells. Given the availability of well tolerated agents targeting this pathway, Hh signalling is a tractable and promising therapeutic target to explore in breast cancer. Developments in this area may offer hope to women with poor prognosis breast cancer. Mun Hui, Aurélie Cazet contributed equally to this work. We thank Drs Darren Saunders and Andrew Franklin for critical reading of the manuscript. This work was supported by the National Health and Medical Research Council (grant ID APP1050693 and a Fellowship to AS), the Cancer Institute New South Wales (Translational Program Grant 10/TPG/1-04 and Fellowship 10/CRF/1-07 to SAO'T) and the Sydney Breast Cancer Foundation (SAO'T). AS received research funding and was financially supported to attend an interstate research symposium by Novartis Pharmaceuticals (Basel, Switzerland) in 2012. SAT is a member of Roche Pharmaceuticals (Castle Hill, Australia) molecular pathology advisory board and in 2012 was sponsored to attend a local research symposium by Roche Pharmaceuticals. Neither organization stands to directly gain from the publication of this review nor are they financing this manuscript. All other authors declare no competing interests.